Not sure whether you want to create an online course or a membership site? Or maybe you aren't even sure what the difference between the two is. Should you create an online course or a membership site? Both can be great options depending on the subject matter you're trying to teach, your needs, and the expectations of your students. A membership site is better if you want to create ongoing content, recurring revenue and a strong community. An online course is better for specific topics that can follow a set number of lessons to achieve an end result, without the need for ongoing additional content. I'm going to share the difference between online courses and membership sites, and help you get a pretty good idea of which would work best for you. 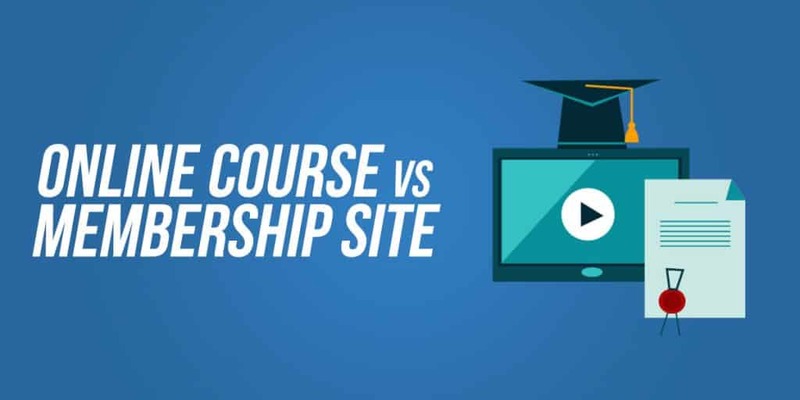 Should You Make An Online Course Or A Membership Site? These days, getting your information and knowledge out there to people is easier than ever. There are plenty of ways to teach people including creating a blog, YouTube channel, or even working with people one on one over the internet. But two of the best and most passive ways to earn an income sharing your knowledge are by creating an online course or a membership site. The terms online course and membership site are often used interchangeably, which can be confusing. So, what's the difference between these two really? The truth is that there can be a lot of overlap and similarities between membership sites and online courses. Both membership sites and online courses are built around providing access to a set of online learning resources, usually in the form of videos, downloadable files, or quizzes. The difference is that with a membership site, your students will pay a monthly or yearly recurring fee and in return you will provide regular new content inside their learning area. Whereas with an online course you tend to make a set of modules, lessons and resources and your students just pay a one time payment to access and learn from them, without the expectation that you'll keep adding to it. There are some clear advantages and disadvantages that may lend themselves better or worse to the type of information that you're trying to share, and how much time you want or are able to spend creating new content. 1) Access is temporarily granted for payment: For example, you might pay a monthly or annual fee to be part of a site. 2) No set endpoint: Your membership continues forever until you decide to cancel it. 3) There's a community: Although not necessary, a big draw for membership sites is often the community. There may be a forum or discussion board available for all members, or perhaps a weekly live mastermind where members can share all of their tips and secrets with each other. 4) Regular content: A membership site usually not a static resource. It's constantly being updated with the latest information on the topic, and new content is regularly released. This provides an incentive for people to pay an ongoing membership fee. A membership site may actually contain a collection of entire courses behind the paywall as one of the benefits of joining. Most membership sites will allow you to join at any time and work through their material at your own pace. Although as of recently there has been an increase in courses that close membership and only allow people to join during a certain time frame each year. Mostly this is used to create a sense of urgency for signing up and to give the site more exclusivity, but it can also be a way to work through a program with a specific group of students all at the same time. Check out this article if you want to see more membership site examples. Usually an online course includes most or all of the following features. 1) One time fee: Normally you pay for an online course once and you get lifetime access to all of the content. There's no annual pay to keep access to the information. 2) More structured: An online course is typically broken down into lessons and modules and there is a specific way that you're intended to work through the information. Usually there is an introduction laying out the steps that you need to take from beginning to end. 3) The way content is released: An online course may make all content available at the start. Or content may be drip fed, such as one module per day or week. The latter is popular in more academic style online courses. 4) Quizzes and assignments: Online courses often give students assignments or quizzes as a way to test what they've learned. These tests may actually be graded, or they might just be used by the student on their own. An alternative to quizzes are “action steps” where a student is asked to go out and apply what they've learned to real life in some way. 5) Progress tracking: The ability to see how much of the course you've completed so far, and automatically opening the course to where you last left off. 6) Clearly defined start and end point: Unlike a membership site, an online course gives you specific step by step guidance through a process from start to finish. At the end you should have a piece of specific knowledge or skill, and the course will no longer be updated. They have a finite length like 10 weeks or 5 modules that won't change over time. Some online courses can be started at any time, such as self study or evergreen courses. While other courses will have a fixed start date so that all students are working through the material together. Check out this article for more online course examples. Here are some questions to ask yourself if you're having trouble deciding between creating an online course and a membership site. – Can you create ongoing content on the topic? Think about all the possible items you want to cover. Do you have enough that you could add a new module to your site each month for a year or more? Are there always new learnings to share or will your audience need a lot of long term ongoing support? Then you might want to make a membership site. – Do you want to commit to an ongoing site? A membership site is much more of a commitment than a course. It might be worth the extra effort as it generally also comes with a higher income, but you'll be expected to regularly make new content for your members or else they'll just cancel their subscription. In comparison, an online course is better for someone who wants a more hands off, ‘passive' style income, though you'll still need to deal with any customer queries and, of course, continue to market and sell your course to generate new customers..
– Does your topic follow a logical and set sequence? Very specific topics that can be broken down into actionable steps and have a clear end result are often best suited to online courses. For example – if you are teaching how to sharpen knives you could cover everything in a set load of lessons which people could keep coming back and referring to. That doesn't mean that online courses are only for smaller topics though – many online courses are really comprehensive with 50 or more video lessons covering a topic in loads of depth. But the point is that there is an end goal to what is being taught. There isn't an need for more content being added over time. – Do you want an online community? Creating and maintaining a strong online community is a big part of a membership site. If you have one, your members will expect you to regularly participate and reply to their questions and comments. Although you may enjoy helping people, it can add a significant amount of extra work each week. Online communities also require moderation and keeping a set of rules and expectations from members, so that's another thing you'll need to watch over as well. Communities are not just for membership sites though. Many online courses offer a community group as part of the course sales package, but often there is less expectation for the teacher to be really active there. Whereas with a membership site you'll be a big part of how the community is run and your members will look to you alot more for inspiration and ongoing learning. – Do you want a recurring income? Membership sites can provide a more steady income as you'll receive monthly or yearly recurring income. You'll need to keep a close eye on your churn rate though, which is the rate at which members cancel relative to new members joining. If people don't feel they're getting enough ongoing value then they'll soon cancel. Assuming you're doing a good job or keeping members happy and adding lots of new content, then can start to build your recurring revenue pretty fast. Income from online courses can fluctuate more, being tied more closely to your marketing efforts, competition, or open/close enrollment periods. Ultimately there's no wrong or right answer about whether you should create a membership site or an online course. It depends on what's important to you, and what the best approach is for your audience and the topic. Each option comes with its own unique advantages and disadvantages. First let's look at online courses. Since an online course provides lifetime access to a large amount of information, you can charge a higher up-front price for it. Creating an online course isn't easy, but it can be less effort to create than a membership site. Mostly since all the work is put in up front and you won't need to come back to it. An online course website can also be a bit easier to market and sell than a membership site as it's often clearer exactly what your customer are going to get. There are a whole bunch of people out there wanting to learn something new. Whether it's playing the guitar or creating successful Facebook ads, someone wants you to teach them how to do it. Pre-launching is gauging the interest level for your course before you actually put in the work to create it. Basically you're testing to see if there's actually a market for the product. If people sign up for your email list and ask for more information, you know there will be paying customers. But if no one seems interested, you've only wasted the time it took to come up with the idea and put your pre-launch materials together, instead of having to create the whole course to find out that no one wanted it. Some things people just want to pay $100 to learn in an afternoon and be done with it. They might not want to continually follow a topic or learn about it on an ongoing basis. An online course can be great for topics like that, or things that can be taught as a tutorial or with clear step-by-step instructions. Once someone has paid for your course, you don't need to worry about constantly producing new content and keeping them engaged. You've already made the content that they've paid for so you can sit back and enjoy each new course join without feeling like you have to keep making more. You only make money when someone new buys a copy of your course. There's no kind of monthly income you get from your course, and unless you've got an upsell for other products, the only way you'll make more income is by finding new customers. There are probably already a dozen beginner guitar, keto diet, or dog training online courses out there. It can be hard to set yourself apart from your competition and make it clear why they should buy your course instead of theirs. Doing this is not impossible, but you do need to choose a good angle on your course topic to ensure you offer something unique. With a membership site your number of students should stay fairly steady from month to month. With an online course you might go from selling 100 copies one month to 0 the next if you don't have a good marketing plan in place. Now let's take a look at membership sites. If you've got a hugely ambitious idea that doesn't seem possible to fit into an online course, a membership site would be perfect for you. In some ways a lower price might seem like it would earn you less money. But a lower price tag can be a strong motivator for customers to buy access to your membership site. Over the lifetime of a membership, you might even gain more money than you would have from a one-off course sale, but having a lower price point can make it easier for people to just join and see what you have to offer. It's easier to see how your course is growing, stagnating, or declining over time. Any decrease in membership will happen gradually unless you make a huge mistake, giving time to correct it. Having a forum, discussion board, private Facebook group or some other kind of built-in community makes it easy to communicate with your audience and to make them feel as if they're able to connect with you personally. This is especially important for internet personalities and brands. Being in touch with your community gives you a better idea of what their preferences and wants are and allow you to tailor your membership site and future products to that. A membership site also has a sense of exclusivity associated with it and creates an “us” group. Membership sites are also better at creating more loyal followers. Your members will expect a less polished product than what they'd want to see from an online course. Especially if you're frequently producing smaller pieces of content. Since membership sites are usually sold at a lower price point than an online course, it can take longer to start building a consistent monthly revenue. Running a membership site takes a lot more time and effort. Like 10x more commitment. You need to be constantly providing new content and proving to members that it's worth their while to not cancel their membership. Producing enough content to mitigate membership churn can be difficult. Nobody wants to join some random guy's membership site if they've never heard of him before. You either need to have a proven track record of success or be a well-known authority figure, such as someone with a big Youtube following. People will expect you to be an expert in your field. Who Is An Online Course A Better Option For? If these sound like you, then an online course might be your best option. You're more of a beginner than an expert in your field. You're new to online marketing and content creation. You have a very specific topic to teach that doesn't change much over time. You're looking for more of a part-time side hustle rather than a full-time job. You don't want to add new content or expand your product on a monthly or quarterly basis. You don't have the time or resources to create an active community. Who Is A Membership Site A Better Option For? If you meet these criteria, you might want to consider a membership site instead. You have a broad niche or topic where you can create a huge amount of content. You're willing to invest the time and effort to make a community for your members. You've sold digital products or run an online business before. You're committed to providing constant value to your members, month after month. You're looking for a more stable long-term income instead of a huge launch. Continually helping people makes you feel fulfilled. How do I create a membership site? The main feature you need is to build an area where you can host your content and restrict access to members only. You could use a membership site/online course platform like Teachable, Kajabi or Thinkific, which are designed to make the job easier and quicker to get set up. Or your can build on your own website using a WordPress LMS plugin. This can give more flexibility but will also require more technical know how and time input. Does a membership site or online course require more time and effort? Generally an online course requires less total number of hours to be put in. But it's hard to compare the two. For an online course, all of your work is put in up front and then you reap the benefits for years to come. You'll have to work hard for a few months to create your course, but then it's a bit more hands off day to day. A membership site can have less setup required, but you'll be putting in work and creating new content every week or month for as long as your site is running. You'll need to be always producing new content and engaging with your community.